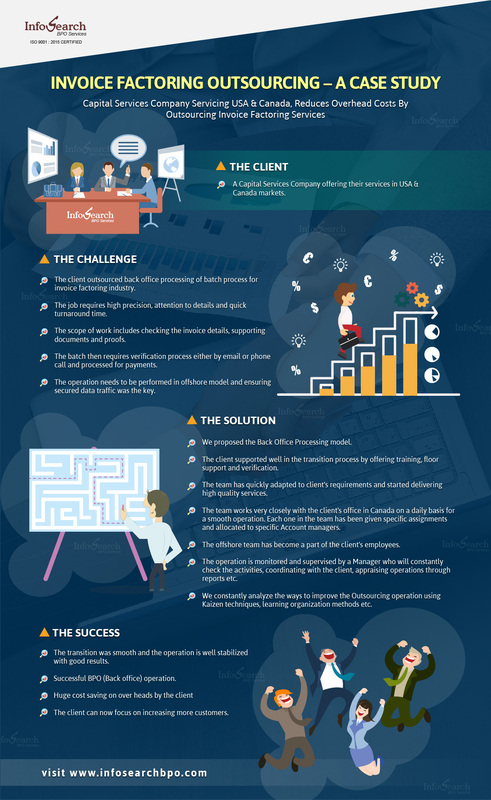 How Offshoring of Invoice Factoring helped an USA-Canadian Firm? Every businessman understands that offshoring a part of his business saves the money and increases the productivity. In this blog post, we are going to identify one such real life success story of an USA – Canada based Capital Services Company. The scenario is the Capital Services Company outsourced their Invoice Factoring functions that serve the USA & Canadian markets. The end results for the client being successful BPO operations, huge overhead costs saving and focusing on core business. Similarly the end result for us being a BPO Company was a loyal client for the lifetime, apart from the monetary benefits, which is clearly a win-win situation.